First wash the lemon and oranges under regular tap water. I know these fruits have a protective peel but it’s always a good routine to do this as all fruits and vegetables have probably been handled by many others before you got a chance to purchase them. Take and roll the lemon and oranges on a hard flat surface a few times as this will help draw out more juice from the fruit. Cut the lemon and oranges in half. Juice the half of one lemon and then the 3 or 4 oranges. This should provide you with a descent size glass of juice. Depending on the oranges sometimes the juice of 3 is plenty. Using an electric citrus juicer works best but if you don’t have one a manual citrus juicer will also get the job done with a little extra elbow grease. Today electric citrus juicers are extremely reasonable and can be purchased for about $20 at your local department store. Once all the juice has been squeezed, place this liquid into a blender and add to it the garlic, ginger and olive oil. Blend well, perhaps a ½ a minute or less is good and then enjoy. 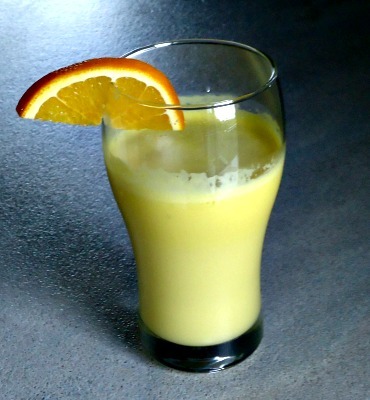 If you are on a budget you can always use fewer fresh oranges and top up the blender with orange juice from the supermarket that is preferably not from concentrate. This helps many stay within their budget while still enjoying this liver detox drink on a more regular basis. You can also make this recipe with fresh apple juice as apples are also an excellent liver cleanser. To make fresh apple juice you will need an actual vegetable juicer for that. Of course we all know if we eat healthy foods instead of junk foods our bodies will have improved liver function as the liver has to work less to detox our bodies of unwanted and unnecessary toxins. Garlic is a liver loving food because they contain a good amount of sulfur and possess powerful antioxidants that help detoxify the body. Garlic possesses so many benefits there are too many to list but it is important to know that it also aids in the absorption of calcium, helps repair and rebuild bone, cartilage and connective tissue. The absorption of calcium helps prevent osteoporosis. Lemons are loaded with vitamin C and are a powerful antioxidant which helps cleanse the liver and body, plus they contain lots of potassium which is essential to maintain several body functions such as heart function. The more antioxidants we consume the better as they help reduce cell damage which will help maintain good health. It helps prevent disease such as cancer, slows down the aging process and offers many other health benefits. There is a long list of benefits of ginger too such as having anti inflammatory properties to helping with digestion and circulation. Olive oil is beneficial as it helps expel unwanted substances from the liver. So I hope you take the time to try a glass of this liver detox drink. It is like a glass of sunshine in the morning and helps naturally sooth a sweet tooth any time as a snack.